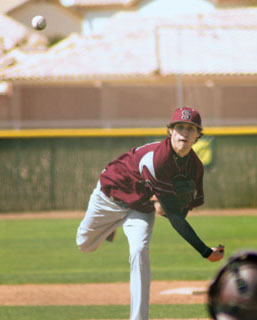 Dylan Jensen ’13 pitched for the team that had its best season in 25 years. Completing the program’s best season in 25 years, the Garnet baseball team—just three years removed from winning just one Centennial Conference game—advanced to the conference playoffs for the first time in program history, reaching the 20-win for the first time since 1986. In the playoffs, the Garnet defeated Washington College before succumbing to Haverford in the semifinals to end the squad’s amazing turnaround season. Four players, Jimmy Gill ’10, Wiley Archibald ’10, Anthony Montalbano ’12, and Spencer Ross ’12 were named All-Centennial, and Head Coach Stan Exeter was named Coach of the Year. Paul Weston ’12 finished with a score of 229—carding a 74 in round one, 80 in round two, and a 75 in the final round—to take fifth place at the Centennial Conference Championship Match from the Stonewall Golf Club in Elverson, Pa. Weston’s performance earned him a spot on the All-Centennial Conference team for the first time in his career. As a team, the Garnet finished sixth at the championships, capturing first place in three events during the season. 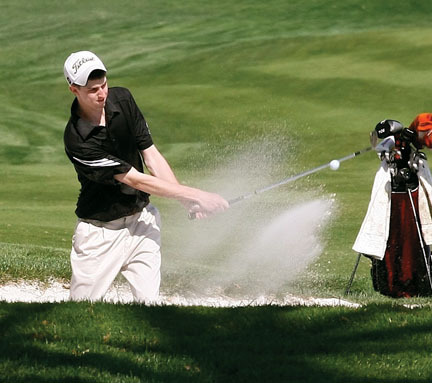 Paul Weston ’12 earned a place on the All-Centennial Conference golf team. It was a tough-luck season for the men’s lacrosse team, as the Garnet lost five Centennial Conference games by a combined total of six goals, including one-goal defeats to NCAA Tournament teams Dickinson and Haverford. The team made the most of its only conference win, however, becoming the first Swarthmore lacrosse team to defeat Washington College in 57 years. Goalkeeper Kevin Friedenberg ’10 capped a stellar career by earning Centennial Conference First Team and USILA All-America Honorable Mention, and Tyler Bradshaw ’10 and defender Max Wilson ’10 were named to the second team. Annelise Mowry ’12 (36 goals), Marie Mutryn ’12 (33 goals) and Amy Vachal ’11 (29 goals) led an explosive offensive attack for a Garnet team that continues to improve in the ultra-competitive Centennial Conference. Mowry ranked among the Conference leaders in goals and points per game, and Vachal reached a milestone by recording the 100th goal of her career in a victory over Immaculata College. Maddie Williams ’12 garnered All-Centennial honors for her outstanding play in the midfield. All-Conference selection Kathryn Riley ’10 left the softball program this year as the all-time leader in wins, strikeouts, and hits, and tied for the lead in home runs. Kathryn Riley ’10 fired her second no-hitter of the 2010 season—just the second in CC playoff history—to lead the Garnet past No. 1 seed Ursinus and into the Centennial Conference Championship Round for the first time in program history. Once there, Swat fell to Dickinson for the title, but it wasn’t for lack of effort by Riley, who finished the four tournament games with a 1.04 ERA and 22 strikeouts. A two-way threat, Riley leaves the program as the all-time leader in wins (53), strikeouts (557), hits (166), and tied for the lead in home runs (9). Along with Riley, Krista Scheirer ’11, Kira Kern ’11, and Danielle Seltzer ’13 were All-Conference selections. The Garnet reached the conference championship match for the second consecutive season but was once again defeated for the title by nationally ranked Johns Hopkins. Stephen Youngblood ’12 earned first-team All-Conference honors for singles play, and Zak Kelm ’12 was named to the second team for the second consecutive season. As a pair, Youngblood and Kelm made the Centennial second team for doubles. 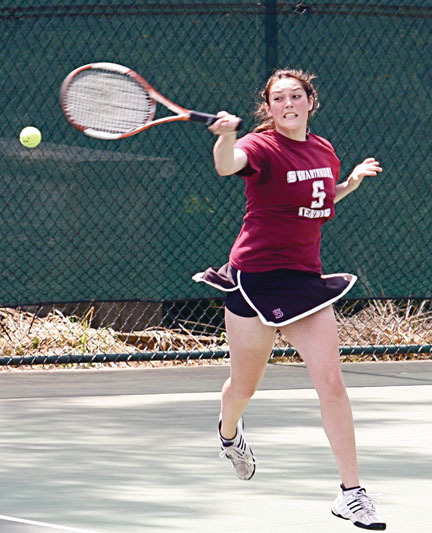 Tennis player Rosie Dubrin ’12 earned All-Centennial honors. Rachel Wallwork ’10 completed one of the greatest careers in the history of Swarthmore women’s tennis, becoming just the second player in Centennial Conference history—and the first since Anjani Reddy ’04—to be named Player of the Year for three consecutive seasons. Behind the play of Wallwork and a talented group of underclassmen, the Garnet returned to the Centennial Conference playoffs after a one-year absence, reaching the title match against Johns Hopkins. Wallwork finished her career winning 24 consecutive Centennial Conference singles matches, a streak that has lasted since her freshman year. 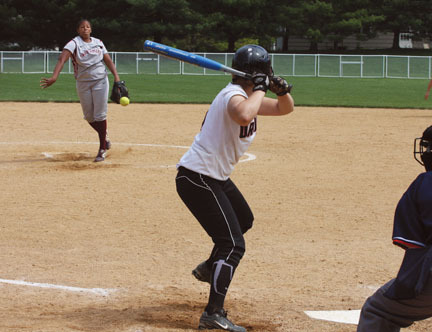 Rosie DuBrin ’12 and Emily Rosenblum ’13 also had outstanding seasons for the Garnet, earning All-Centennial honors. Dan Ly ’12 earned a bronze medal in the long jump with a leap of 21’ 44”, leading the Garnet at CC Track & Field Championships, held at the College. 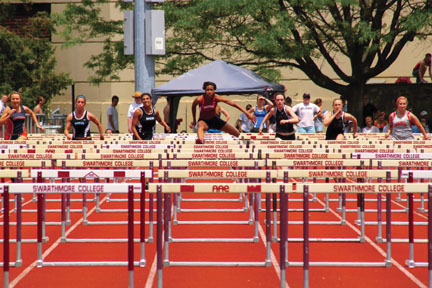 Chris Mayer-Bacon ’11 took fifth in the 400-meter hurdles (57.57) and sixth in the 110-meter hurdles (16.50), with both times making the Swat Top 10 list. Kenyetta Givens ’12 broke another school record at the CC, winning gold in the 100 meter hurdles. 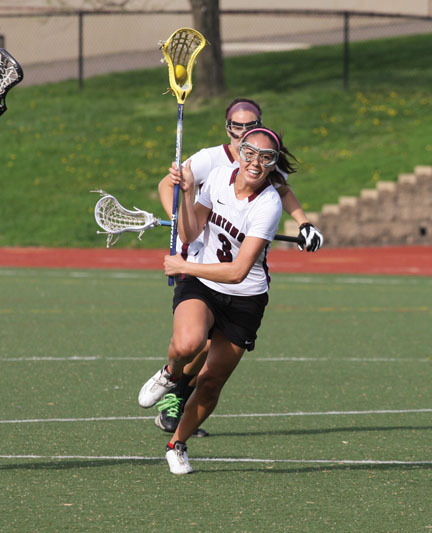 Lacrosse offensive player Amy Vachal ’11 recorded her 100th career goal. Kenyetta Givans ’12 brought the home fans at Clothier Field Stadium to their feet at the Centennial Conference Track & Field Championships at the College, winning gold in the women’s 100 meter hurdles in a school-record time of 15.05. The women’s 4 x 800 team—consisting of Erin Ronhovde ’10, Lauren DeLuca ’10, Margret Lenfest ’12, and Rebecca Hammond ’13—also earned a first-place finish, repeating as Centennial champions with a time of 9:20.15.